Had a long weekend, so we escaped to the ocean. It was a great experience as always. In fact, the only complaint was the weekend was over way too quickly, heh. But that's life. Looking forward to the next get-away opportunity! We were there for 2 nights and loved it. This is the 2nd time we've been in this unit and it works perfectly for a family with pets. Close to the beach but not so close that the dogs barked at the surf. My husband and I travel every year with on our anniversary along with a couple that are our best friends that celebrate their anniversary at the same time. We truly love staying at Vacations By The Sea because the condos are beautiful, the amenities are fabulous and the beach is wonderful. We will continue to go there every year without a doubt. We're excited to hear our little place is associated with such a great tradition in your family. See you again next year! We had a great time on our trip and the condo was very inviting and comfortable. We would definitely stay here again. We are coming back next year and if this unit is available we want this again. Next time we will go fishing. The unit is so large and loved everything about it. So nice. We usually go to Gearhart,Or. which is nice too, but these are so much are much newer and brighter. Happy to hear you and the family enjoyed your stay. People have been coming to Westport to escape the city heat for over 100 years, glad you found it refreshing here! The condo was perfect. It had all the amenities we could want. It was well decorated and clean and very homey! The beds were very comfortable. Will be staying here again! The beach was right there and the condo property had plenty of hosing off stations to clean up. The condo was beautifully set up. we had 2 couples so the fully stocked kitchen was awesome. We were comfortable, close to the beach, we couldn't ask for more. this is the second time we've stayed with this company. 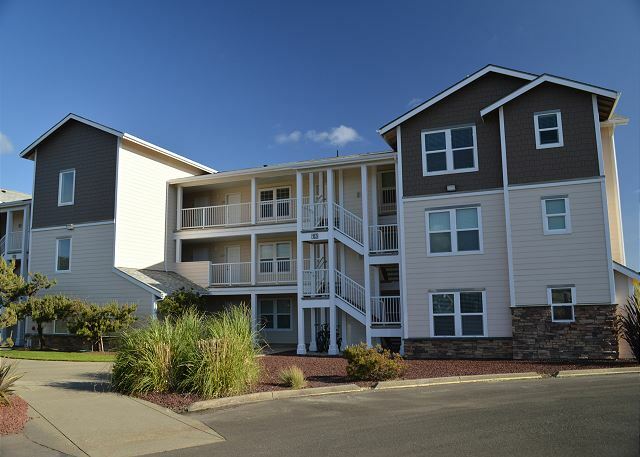 What a wonderful sunny weekend we had, when staying at this beautiful Westport condo named Vacations by the Sea! We took advantage of a special that was run where the 2nd day was half-price. Little did we know we certainly wouldn't need the fireplace! There was just enough wind, plenty of sun, and we took advantage of the outside activities. There is an asphalt walkway that runs parallel to the Pacific Ocean. It's perfect for my husband to push me in my wheelchair along the walkway with our dogs. The condo was outfitted with everything we could possibly need, including games, magazines, and high tech equipment from stereo. to cable on TV. In times past, we would welcome the indoor entertainment our condo offered, but we couldn't stay inside this particular weekend until we had to come inside. When the sun came down. We took lots of beautiful photos, and even picked up a pizza on the way back. Did you know there's a pizza place that you can go to, or a local Subway to get a submarine sandwich. There is a new and improved grocery store within walking distance, that has all kinds of things any cook or bottle washer could want! We have stayed at Vacations by the Sea many times. Each unit is clean smells wonderful and it stocked with everything you would ever need for a weekend away from home. Why don't you consider coming to Westport and staying at the condo. You won't be sorry! We rented 1315 and 1313. The family from 6 to - 72 yo had a great time. The beach with the winter is different everyday. Biking is a great time. We had a lot of fun and plan to return during all the seasons. The property was very clean, well-maintained and the kitchen was well-stocked. Very close to the beach, and we enjoyed the pool and hot tub too. Very nice experience. The condo was neat and clean. The late in the day check-in was a little disappointing. For me 4:00 p.m. is late. Thanks for staying and sorry you were disappointed with the check in time. We do our best to get folks in earlier and if the lock box is hanging on the door frame, then the condo is ready for you. On busy summer weekends when guests are departing and arriving on the same day, we do need time to thoroughly clean each condo which is why the check-in time is 4pm..
We were here for the Thanksgiving Holiday. We rented 3 condo's next to each other (1313 1314 &1315) so our large group could be together. All the condo's were clean and well equipped with all we needed for our feast. We felt very much at home here. We give all 3 condo's a 5 star rating!! Thank you! We love Vacations by the Sea...this is at least our 7th trip! #1313 was perfect for us this time around. Our kids have grown, and we also have a dog now...this condo has plenty of space, is clean and and minimally decorated, and had everything we needed, even two boogie boards! Bottom level, close to everything, and the staff was AWESOME. Thank you! This is my fourth stay at VBTS. AS usual it was a wonderful stay. the staff was condo was clean, well-equipped, and well-kept. The staff was worm and helpful, and all the amenities were enjoyed-again! Was a bit sad the jetted tub didn't work. Thiswas our third stay at VBTS and definitely not the last! The adults relaxed, kids played endlessly, and the dogs were in their element!The staff was helpful, accomodating and friendly. Our condo was tastefully furnished and well-equipped and the setting so peaceful. While we were stil there we were already planning our return next summer! Family enjoyed our stay at Westport. Vacations by the Sea was clean and kid friendly. The Vacations by the sea rental was a wonderful place to stay. The rooms were large, the spaces very nicely furnished and it was located a short walk to the beach. I would highly recommend this to anyone going to Westport. We were only there one night so did not get to use all the facilities we would have liked to. Great family and pets place. Had a great time, will return. The wife, the kid,the dog, and I all had a great time. We will return for sure. The rooms were very open and spacious. We had a great time and the weather was perfect. The only downside was that the pool was closed even though the weather was in the 70's, the hottub was open but not working properly that weekend so it was not heated and the gas fireplace was not working in our room. The maintenance man did come right away to see what the issue was with the fireplace (kudos to management) but was unable to fix it. Since the Crab Festival going on and the weather was so nice, the fireplace and pool were not that big of an issue. The rooms were clean and neat and all neighbors were extremely quiet, it felt like we were the only ones there. Overall everything was nearly perfect! I recommend this place if you would like something more upscale and can afford the price per night. We thought it was definately worth the cost and had a great weekend. bed pillows could have been a bit larger. the beds weren't very comfortable (we have lower back problems). it would be nice if the beds were a sleep number type bed or some type of memory foam bed that is comfortable for more body types. A great place to stay, clean and roomy, peaceful and quiet. Thanks for the nice weekend. Vacations by the Sea is a great place to stay. The staff is great, and great customer service. This condo was exceptionally clean and comfortable. I liked how it had a lot of seating in the living room and a big dining room table to fit all 6 of us that was staying there. This is the 4th time time staying at VBTS, the best place to stay at Westport. We stayed in Unit 1313 over the 4th of July weekend and we were really pleased with the accomomdations. I have stayed in other rentals and this one was the best I've found yet. Immaculate, well-equipped kitchen/bathrooms/bedrooms and a fun property with little playground, nice pool and spacious clubhouse. The bedrooms were large, we had a decent TV (not flat-screen, but it was big enough) and a DVD/VCR. The only thing I'd have to say negatively about the property is that our upstairs neighbors (who seem like they might live there all the time) liked to play their music VERY loudly during the day and early evening, which was sometimes a little frustrating. But they respected the quiet hours, so we couldn't complain too much. All in all, I'd recommend this as a very family-friendly place and we will definitely be back! Excellent condo! I would highly recommend it. Thanks for the great review, we hope to see you and your family again soon! This place was fabulous!!!! Very tasteful decor, clean, very quiet, just a great place. We have been staying at Ocean Shores 5 or 6 times a year for the past 20 years but will be sharing the time between the 2. Our second stay but definitely not our last. The staff consistently provides a warm, welcoming experience every step of the way from booking through checkout. Even complicated reservations proved to be no match for their effervescent personality and dedication to quality service. The only drawback to the property is that you have to go back to the real world at the end of your stay. We feel that the kitchen in unit 1313 needs to be better stocked with dishes, pots and pans, tupperware, bowla and utensils.